There’s no place quite like Mono Lake. With its strange tufa rock formations, volcanic cinder cones and ultra-saline waters filled with brine shrimp and brine flies, Mono Lake is unlike any other lake in the western U.S.
An excellent place to learn about Mono Lake is the Mono Basin Scenic Area Visitor Center near Lee Vining. The center, which opened a few years ago, contains many informative, interactive displays describing the unique features of the lake and the region. For instance, the first exhibit, entitled “Who Lives Here,” shows models of the various animals and birds found at the lake. Interactive lights spotlight violet-green swallows, deer mice, California gulls, gebes, weasels, owls, squirrels, and phalaropes. An adjacent display details how Mono Lake is fed—it receives about 7 inches of water annually—by five streams as well as freshwater springs, rain and snow. Another display describes how the lake’s famed tufa rock was formed and offers examples of the different types of tufa. Other exhibits describe the Native Americans who once lived around the lake, who were known as the Kuzedika. A traditional Kuzedika bark house, made of poles, grass and juniper bark, has been reconstructed in the exhibit room. Mono Lake is 2 1/2 times saltier than the Salton Sea and 1,000 times more alkali than the ocean, which gives it unusual qualities. More than 700,000 years old, Mono Lake is one of the oldest lakes in North America. Originally formed by melting glaciers, the lake once measured five times its present size of about 60 square miles (at its peak the lake covered about 338 square miles and reached a depth of 900 feet). In addition to having direct ties to the Ice Age, the lake has been the site of extensive volcanic activity, starting about 13,000 years ago, which helped shape its development. For example, the rounded black hills to the south are remnants of giant, uplifted volcanic craters. At one, Panum Crater, easily accessible from Highway 120, you can hike to the dome and rim of a long-dead volcano. The area’s volcanic heritage is also evident at Black Point, at the lake’s north end, which features large fissures you can walk through, and at various hot springs and steam vents found in the basin. The lake’s trademark tufa formations, however, are its most impressive and unusual landmarks. At various places around the lake, you can find clusters of these towering calcium spires and plugs. Tufa is formed when calcium-bearing freshwater springs bubble up through alkaline lake water that is rich with carbonates. When the two combine, limestone deposits form, which can over years grow into large towers. Tufa formations can only grow within the lake. When the lake level falls and the tufa is exposed to air, it ceases to grow. 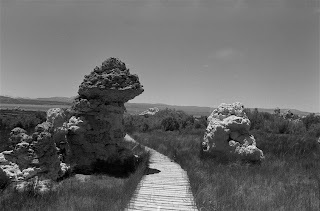 A number of interpretive trails lead to patches of tufa formations located around the lake. The most popular trails begin at the Visitor Center, near the Mono Lake County Park at the north end and from the South Tufa Area at Navy Beach (accessible from Highway 120). The latter contains some of the largest and most impressive tufa. Dozens of the gnarled, knobbed, and rippled tufa towers line the southern lake shore. Visitors can wander along the beach, wandering through the maze of formations, which, depending upon the light and your mood, can assume exotic and mysterious shapes. While the lake appears dead, it is actually an alkali soup of unique lifeforms. Both the brine shrimp and brine flies flourish on its algae-laden waters. Additionally, the lake is popular with many species of birds (who eat the shrimp and flies), including gulls, grebe and snowy plovers. In fact, 90 percent of the state of California’s population of California gulls is born at Mono Lake. Swimming is permitted in the lake and, because it is so salty, you can float easily. However, rangers warn that you should keep the water out of your eyes or any cuts because it will sting. Despite its unique qualities, it’s a miracle that Mono Lake continues to exist. In 1941, the City of Los Angeles began diverting water from four of the streams that feed the lake. During the next few decades, the lake level dropped 40 feet and doubled in salinity. Fortunately, environmentalists and the city have worked out agreements protecting the flow of water to the lake that will help it regain some of its previous levels. Mono Lake is located about two hours south of Carson City Fallon via U.S. 395. The Mono Basin Scenic Area Visitor Center is open daily from 9 a.m. to 4:30 p.m. (8 a.m. to 5 p.m. in the warmer months). For more information, call 760-647-3044, http://www.monolake.org/visit/vc. The former mining camp of Pioche in eastern Nevada has aged gracefully. The first settlers in Pioche were miners attracted in 1864 by the news of silver discoveries at Panacker Ledge on the northeast side of nearby Ely Mountain. The camp was originally called Ely after John H. Ely, owner of one of the earliest stamp mills. In 1869, financier Francóis L.A. Pioche of San Francisco purchased most of the area’s mining claims and had a town laid-out, which was named for him. The town boomed and by 1871, it had 7,000 residents and had taken the seat of Lincoln County from nearby Hiko. Because of its remote location, the town also gained a reputation for lawlessness. 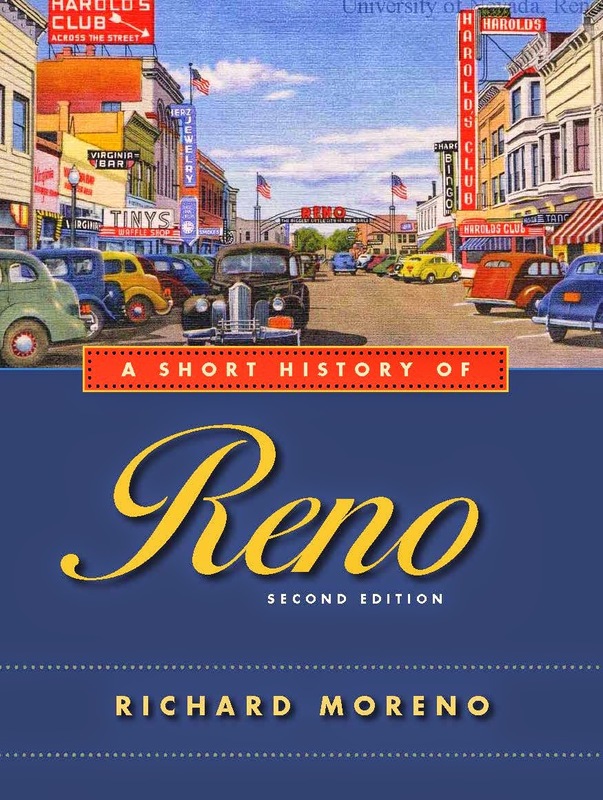 In fact, several books claim that the town was so violent that 72 men were buried in the Pioche cemetery (found east of town) before anyone died of natural causes. This two-story stone hall of justice gained its moniker because, it is said, over the years the building cost nearly $1 million due to mismanagement, corruption and cost overruns. Although the courhouse was built in 1872, it wasn’t paid off until 1937. Wandering the streets of Pioche is an opportunity to see dozens of historic homes and buildings—many in use—that date to the last century. For example, adjacent to the Million Dollar Courthouse is the Mountain View Hotel, built in 1895. Originally owned by the Ely Valley Mines to house its guests, the three-story wooden structure incorporates the early 1900 “Classic Box” style of architecture with the Shingle style. It awaits restoration. Nearby is the St. John Masonic Lodge, a restored brick building, originally erected in 1873, that is one of the state's oldest fraternal chapter houses. Across the street are the Pioche Livery Stable and Tin Fabrication Building, from the early 1870s, as well as the Pioche Fire House and the Amsden Building, both built in 1865. Behind the firehouse, on Main Street, is the Orr Garage, a stone building from the early 1870s, believed to have once been a blacksmith shop, and the Brown/Thompson Opera House, built in 1873. The opera house is noteworthy because of its classic revival architectural style and age—it is one of the oldest mining town opera houses remaining in the state. South of the opera house on Main Street is Pioche's main commercial district, which contains a number of historic buildings including the Stockham House, at the south end of the district, built in 1866. Originally a boarding house, it houses the Francois L.A. Pioche Art Gallery. 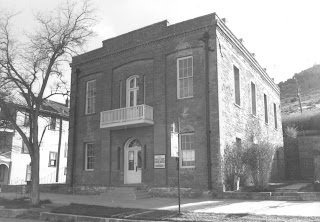 The Lincoln County Museum on Main Street is housed in the A.S. Thompson building, built in 1900, It was originally a clothing and mercantile business. The museum contains a fine collection of 19th century mortician tools, several organs, and lots of mining artifacts. Beyond the downtown core, Pioche has a handful of other historically significant structures, including the Pioche School, built in 1909. Except for the Caliente Depot, the school is the only Mission style building in Lincoln County. It is also the oldest continuously used school building in Nevada. Of more recent vintage is the Overland Bar and Hotel, built in 1940. The club originally had a bowling alley in its basement and remains in use as a popular local restaurant and watering hole. Another intriguing landmark in Pioche is an aerial tram system that runs over the mountain that overlooks the town. Constructed during a short mining boom in the 1930s, tram carried ore from mines on the hillsides south of town to the Godbe Mill and Smelter, the ruins of which are located just north of the community. If you climb to the top of the hill overlooking the town, you can get a closer view of the tram, which still has ore carts suspended from its thick, rusted steel cable. Additionally, you will find an outstanding overview of the area. Pioche is located three-and-a-half hours northeast of Las Vegas via Interstate 15 and U.S. Highway 93. For more information, contact the Pioche Chamber of Commerce at www.piochenevada.com. Perhaps the best thing that ever happened to Bodie is that everyone left. The town, founded in 1859, was largely abandoned by the 1920s. Since a mining company owned most of the town site, caretakers protected the town for many decades, keeping it from being vandalized like a lot of other ghost towns. As a result, Bodie is one of the West’s best-preserved 19th century mining towns. Bodie traces its beginnings to the discovery of gold in the area by William (also known as Waterman) S. Bodey. Some say the difference between how his name is spelled and the name of the town was the result of an illiterate sign painter. Within two decades, Bodie had grown to more than 10,000 residents. Along with the usual frontier town development, such as saloons (allegedly more than 65), churches, schools and union halls, the town also gained a reputation for lawlessness. Murders were said to be so commonplace that the fire bell was used to toll the ages of the deceased as they were buried—and it rang frequently. There were also plenty of robberies, stage holdups and fights. The town began to decline in the early part of the 20th century and was mostly abandoned (although the buildings were protected by caretakers). In 1962, it was acquired for preservation by the California Department of Parks and Recreation. Visitors today will find a fairly extensive series of buildings and remains of old Bodie. Dozens of structures, ranging from homes to businesses still stand. Despite the large number of preserved structures, present-day Bodie represents only about 5 percent of the town at its peak. Park rangers offer regular guided tours of the town. The tours are highly recommended because they are informative and provide an excellent overview of the community. The tour begins in front of the Methodist Church, a classic weathered wooden frontier church with a small bell tower. 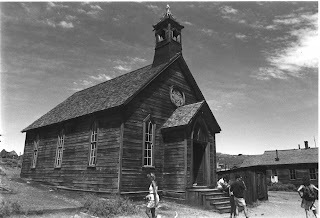 The church was built in 1882 is the only house of worship still standing in Bodie (it apparently survived because it was restored in the 1920s and used until 1932). Around the church, are a handful of residences, some used by the park rangers who live in the town all year. Each has an interesting story, such as the James S. Cain house, built by the town's largest lumber company magnate and landowner. As you walk the streets—using the invaluable state park brochure that describes each building—you learn more about the community. You pass the Livery Stable, which once accommodated dozens of horses, then continue by the wooden Firehouse, which over the years survived numerous fires that destroyed much of the town, and the Bodie Miner's Union Hall, now a museum and gift shop. Surrounding the town are other interesting survivors. To the south is the cemetery, which actually consisted of four separate burial grounds; one for the Masons, one for members of the miner's union, one private cemetery and one for the Chinese who lived in the area. To the northeast are the substantial remains of the Standard Mill, which yielded nearly $15 million over a 25-year period and sparked a major rush to Bodie in 1878. The original mill burned in 1898 but was rebuilt the following year. To the right of the mill was the residence of Theodore Hoover, brother of President Herbert Hoover. Years after he departed Bodie he became the director of the School of Mines at Stanford University. The Standard wasn't Bodie's only mine. The total yield from the Bodie region over about 40 years was nearly $100 million. Bodie is located about three hours south of Carson City via U.S. 395, then ten miles on a paved road and three miles on a maintained dirt road. The entrance road from U.S. 395 is well marked. It is best visited during the summer months when the dirt road is dry. The park is open year-round, 8 a.m. to 6 p.m. in the summer and 9 a.m. to 4 p.m. the rest of the year. For more information contact the Bodie State Historic Park, 760-647-6445, http://www.parks.ca.gov/?page_id=509.